STAT2, also named as p113, belongs to the transcription factor STAT family. It is a signal transducer and activator of transcription that mediates signaling by type I IFNs (IFN-alpha and IFN-beta). Following type I IFN binding to cell surface receptors, Jak kinases (TYK2 and JAK1) are activated, leading to tyrosine phosphorylation of STAT1 and STAT2. The phosphorylated STATs dimerize and associate with ISGF3G/IRF-9 to form a complex termed ISGF3 transcription factor, that enters the nucleus. ISGF3 binds to the IFN stimulated response element (ISRE) to activate the transcription of interferon stimulated genes, which drive the cell in an antiviral state. It also interacts with CRSP2, CRSP6, Simian virus 5 protein V, rabies virus phosphoprotein, IFNAR1 and IFNAR2. Its interaction with dengue virus NS5 inhibits the phosphorylation of STAT2, and, when all viral proteins are present (polyprotein), STAT2 is targeted for degradation. 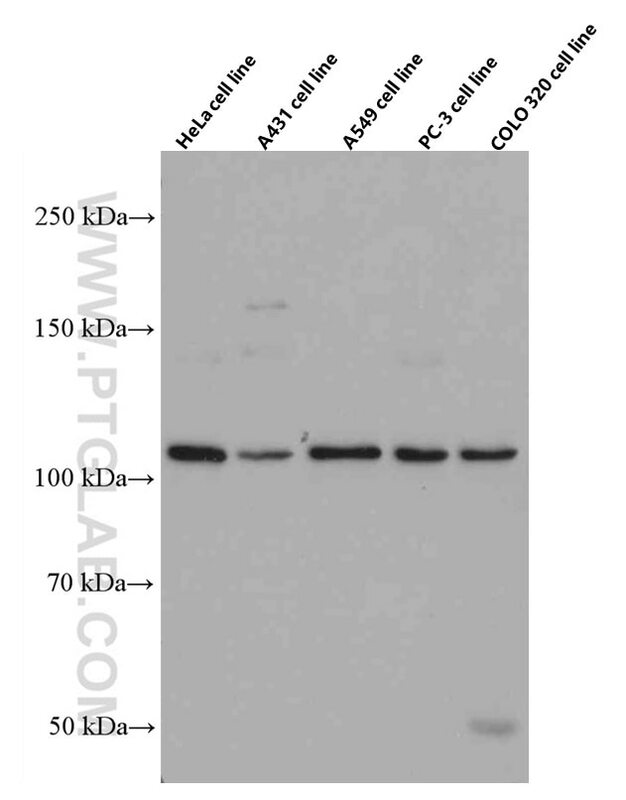 The calculated molecular weight of STAT2 is 98 kDa, but phosphorylated STAT2 is about 100-113 kDa.